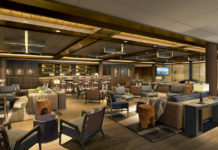 Aboard Seabourn Odyssey, guests can choose from 225 ocean view suites measuring 295 to 1,682 square feet, the majority of which come with private verandas. 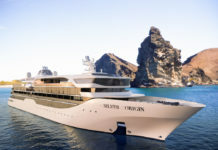 All Seabourn Odyssey suites feature a full-length window, comfortable living area, queen-size bed or two twin beds; walk-in closet with personal safe, interactive flat-screen television with music and movies, fully stocked bar and refrigerator, writing desk, makeup vanity, granite bathroom with separate tub and shower, and hair dryer. All suites include complimentary champagne upon arrival, 24-hour room service, personalised stationery, fruit basket replenished daily, fluffy terry-cloth robes and slippers, Eqyptian Cotton linens, a fluffy duvet, fine soaps by Hermés, Bijan and L’Occitane, Pure Pampering Aromatherapy by Molton Brown, nightly turndown service, daily newspaper, World Atlas, clock/barometer/thermometer and umbrella. 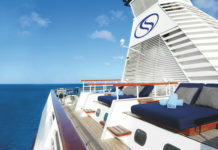 Seabourn Odyssey offers a range of culinary options, to suit all tastes. The Restaurant presents eclectic menus developed specifically for The Yachts of Seabourn by celebrity Chef Charlie Palmer. Traditional Italian espressos and lattes can be enjoyed in Seabourn Square. The six bars and lounges offer world-class wine, champagne and top shelf spirits. The gourmet open-seating Restaurant spares nothing, offering guests Charlie Palmer’s exceptional cuisine at tables set with exquisite china and crystal. Most evenings, attire is elegant casual. On special nights attire is formal optional. After dinner, dance the night away in the sophisticated supper club setting. Intense flavours, stellar service and intriguing food and wine pairings are the specialties of the house in this avant-garde restaurant. Dishes are prepared individually by the chef in tasting portions so you can enjoy a selection of innovative creations. At the Colonnade, chefs serve breakfast, lunch and dinner in an open kitchen so guests can watch them work their magic as they personally prepare orders. Each evening has a different theme, offering guests an ever-changing culinary experience. Enjoy breakfast, lunch or dinner poolside at the Patio Grill. The superb offerings are sure to delight the palette as you enjoy the relaxed ambiance by the pool. Those seeking a late night pizza or just some fresh crudités in their suite will make good use of the extensive room service menu around the clock. During dinner hours, guests can choose to have dinner served course by course in their suite, complete with fine linens and personal service.